Monfriez: You ever kill anyone at close range with a small arms, sir? 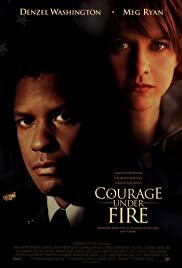 Q: Why does the term "A Medal for Honour" with the British spelling of "Honour" appear next to Meg Ryan's face? 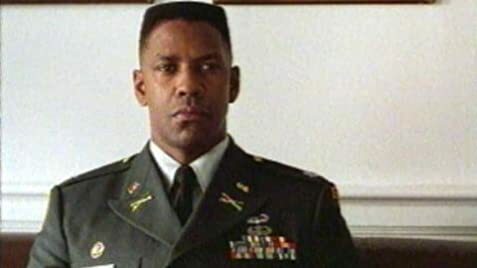 A DESERT STORM-era update of "Rashomon"
A DESERT STORM veteran, Lt Col Nat Serling (played by Denzel Washington), is assigned the task of recommending whether or not to award the first (posthumous) combat Medal of Honor to a woman, Capt Karen Walden (played by Meg Ryan). In investigating the inconsistent mission accounts of Walden's surviving crew, Serling constantly flashes back to his own searing DESERT STORM experience and the Army's subsequent attempts to whitewash the incident, resolving that his investigation will not suffer the same fate. As Serling tries to rectify the competing competing accounts it becomes clear that director Edward Zwick has crafted a contemporary "Rashomon," complete with reminders that the truth is always subjective and our accounts of it typically affected by self-interest.